This entry was posted on October 2, 2013 by TemplatesMaster. 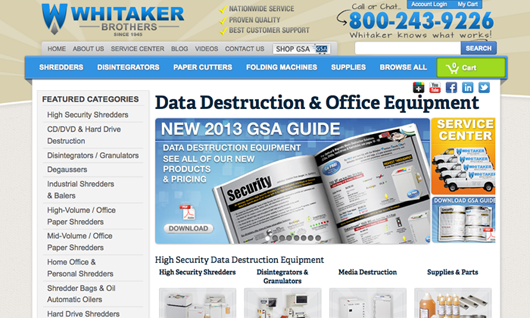 WhitakerBrothers.com is a b2b store that is most known for their data destruction equipment such as high security shredders and disintegrators. Basically, that translates into selling machines that destroy things. 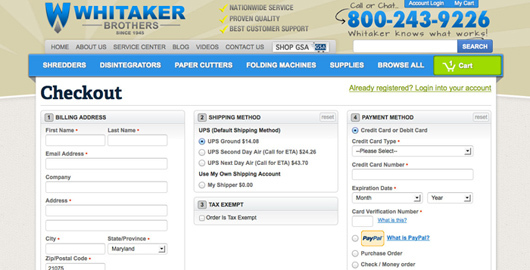 We’re also one of the biggest dealers for regular office shredders, paper folding machines, and paper cutters. Compared with other office product dealers, Whitaker Brothers limits their product line to proven equipment that we test ourselves at our locations in Maryland & California. This hands on approach to selling online gives us the credentials of being an extremely knowledgeable and trustworthy resource for shoppers. We’ve been around for over 70 years at this point, but our website is only about 15 years old. We started with a static site, then evolved into a home-grown CMS website based in asp.net. We survived this way for about 10 years. You can imagine that after 10 years, the website began to look a little out-of-date. The biggest challenge, however, was code-base maintenance and adding new features. After 10+ years of enduring the fierce limitations of an outdated system, we were ready for change and began hunting for an ecommerce solution that would be flexibile, inexpensive, and most importantly, still be around years after implementation. Why did you choose Magento? We chose Magento #1 because it was known for being flexible. We have a lot of picky requirements here (aka picky staff) so we knew we would need a tool that could handle 90% of the requests. Much of what makes our business a bit more tricky than others is the fact that our products can be small or extremely huge, sometimes as big as multiple pallets. We also have very complicated tax calculation requirements, because of the large number of tax exempt customers and multiple locations around the U.S. The second main reason we chose Magento is because we were confident that the software had longevity. We could see the explosive growth and saw that it was going to be a dominating force in the ecommerce CMS battle. Since our initial launch, Magento is now backed by ebay and has grown way faster then we even expected, proving that it continues to be a safe technology to invest in. You can share some facts about your ecommerce experience. Since launching our store our online sales have quadrupled. One of the biggest surprises was the $ size of the orders. Upon launching, we assumed that the majority of sales would be small supply related items. However, we quickly found that even large and complicated equipment actually leant really well to sales through the website. One example of this is a fairly large shredder called the Destroyit 2604 (click here to view), which has grown to be one of our most popular models. This lowered the communication overhead of taking all orders over the phone, and made it easier for customers. Some of this success I definitely contribute to template-master.com’s Fire Checkout extension. 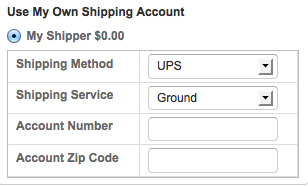 Magento itself is an awesome piece of software, but it is truly lacking when it comes to the checkout. Fire Checkout plugs this feature gap surprisingly well. Just few words. You can also tell us if you are happy or not. We’ve actually tried other similar solutions and found that, although they looked good at first, over the course of weeks and months we continually ran into small bugs. After coming to a point where we couldn’t ignore customer complaints about other solutions, we decided to try Templates-Master.com’s Fire checkout. We’ve been using Fire Checkout for well over a year, and it’s held up extremely well. We even customized it, adding a new step for tax exempt customers to remove the tax calculation. We’ve also added various shipping extensions, such as freight shipping and the ability for customers to enter their own shipping account. Despite all of these changes, the checkout still works smoothly. We were really glad to hear that you have positive results using our one page checkout extension Fire Checkout. Why did you decide to start working with Templates Master’s extensions and templates? A lot of the reason we chose Templates Master was the same reason we chose Magento. After using them for smaller extensions, such as a ProLabels (absolutely essential extension) and seeing the high level of support, I was confident that we would be in good hands for something as important a new checkout system. After seeing their new product releases and continuous updates, I was confident that they weren’t going anywhere anytime soon, just as Magento isn’t. So far, our expectations have been more than met with everything they’ve been able to help us with. Can you share any results of using Fire Checkout? 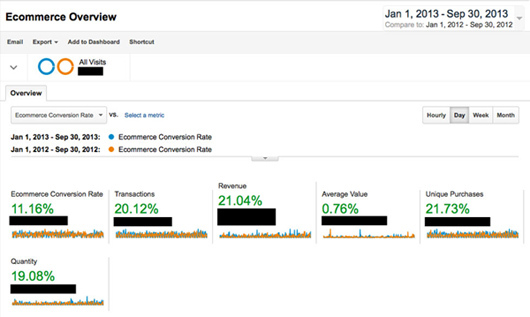 * Keep in mind that these numbers represent Fire Checkout vs. another Magento checkout extension. Some growth can be explained in other ways, but Fire Checkout was definitely a good part of this. *Beside the numbers, the biggest change we’ve seen are less customer complaints about the checkout causing various little bugs that confuse them. 1. I like that the design keeps the many fields organized and easy to follow for customers. It’s also generally attractive. 3. The order summary is very tidy and helpful. It presents the customer with assurance that the order is accurate. It just seems like the right thing to do. I would love Fire Checkout to provide an order summary on the final “thank you” page. I know that this isn’t directly related to the checkout page, but this feature is currently requested in the forums in mass. Many of our customers I’ve spoken to during the checkout process expect to see the details of their order on the final confirmation page, rather than waiting for an email. In the case that the email confirmation doesn’t make it to the customer’s inbox, at least the customer would have visual confirmation and even the ability to print the screen for their records. Although this is more of a core Magento request and not a Fire Checkout request, I think there is a big demand for this, and based on their success with Fire Checkout, I think Templates Master would be a good fit for the challenge. Yes, the biggest advice for ecommerce beginners that I have is to dive right in and start building. There are endless amounts of details to hammer out, and if you worry too much about getting everything perfect, you’ll never get started. It’s important to know upfront that you will get things wrong, but at least you’ll be making sales while your hammering everything out. In large corporate environments this isn’t always possible. In this case, I recommend starting an active side website. This type of project is much easier to get approval for w/ less ramification of failure. This is exactly how we got started. After proving that the solution is viable, we moved to our primary website. Do you have any special offer for our clients (optional)? Yes, use coupon code “TEMPLATESMASTER” to receive 15% off all shredder supplies such as oil and bags. The offer also applies for cutter supplies such as knives and sticks. If you’re looking for a new shredder (big or even small) or other type of office equipment, just mention “TEMPLATESMASTER,” over phone, chat, or email, and we’ll give you the best possible deal on the equipment you’re looking at.